It was in the late 1990s when I discovered the work of Felix Gonzalez-Torres. The retrospective had ended three years earlier and I realised seeing his work would be a challenge. So I began with The Rosen Gallery, which has represented the artist since 1990. I went to the first exhibition after Gonzalez-Torres’s death in 1996. The Rosen Gallery was my first experience at NYC art gallery and it was memorable. Last month I came across an old catalogue and couldn’t help but think of the knowledgable staff who gave a teenage girl an informal tour, maybe that’s why my interest in Felix Gonzalez-Torres endures. 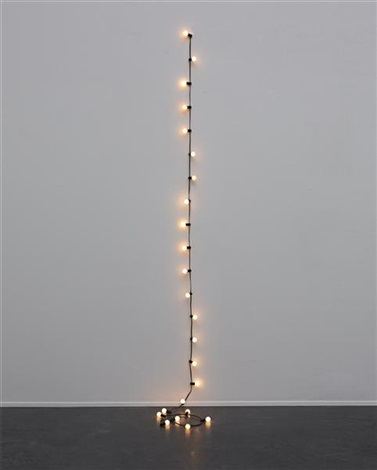 The Rosen Gallery currently has an exhibition of Felix Gonzalez-Torres’s work, it’s part of a simultaneous exhibition that is taking place in NYC, Milan, and London. The exhibition opens at Hauser & Wirth on 27 May 2016 and on 20 May 2016 at Massimo De Carlo in Milan. One of my favourite installations is Untitled (Last Light), this minimalist piece consists of dim string lights in a cold gallery space. It’s a powerful installation. There are a series of photographs depicting a bed of flowers, Untitled (Alice B. Toklas and Gertrude Stein’s Grave, Paris), this piece seemed personal. I’m not sure if the couple’s relationship impacted Gonzalez-Torres or what he was trying to create, but these images evoke sadness. Perhaps we’re meant to be content knowing the couple has reunited in death; the themes of love and loss are still there, but Gonzalez-Torres manages to remind us how fleeting it can be. I’ve often wished that I had learned more about Gonzalez-Torres, the Oscar Wilde piece (rewritten fragments from Salome: A Tragedy in One Act), and Untitled, the 1991 billboard of an empty bed. I knew there were themes of loss and perhaps, rebirth in his work. He lost his partner, Ross, to AIDS related complications. I know that impacted his art. There weren’t an abundance of interviews available. A few years later, I ended up searching old art and literary magazines in the college library. There are a couple of interviews: one published in 1995 from ArtPress and another in a 1993 issue of BOMB Magazine. I wanted to know more…I still do. Gonzalez-Torres’s editor, Julie Ault has compiled critical essays as well as the artist’s personal correspondence and lecture notes that will be published 22 November 2016. You can find more information here. If you can visit one of these exhibits, you won’t be disappointed. Gonzalez-Torres’s art will leave an imprint on your soul. P.S. I’ve just started reading Deborah Levy’s Hot Milk and that prose is breathtaking. I’ll write more about it soon.